In September 2016 the Aspen Institute, a non-partisan American think-tank, held a symposium entitled “Firearms and the Common Law Tradition” at the Institute’s headquarters in Washington, D.C. The conveners of the symposium, historian Jennifer Tucker of Wesleyan University, curators Margaret Vining and Bart Hacker of the Smithsonian National Museum of American History, and Ruth Katz of the Aspen Institute, hoped to create space to discuss constructively the changing meaning of firearms in American culture and to identify new areas of research that will allow historians and legal professionals to think creatively about the challenge of guns in American law and culture. The conveners invited a broad spectrum of participants, including historians who take opposing views of what the Framers of the American constitution meant to enshrine in drafting the Second Amendment, which famously proclaims that “A well regulated Militia, being necessary to the security of a free State, the right of the people to keep and bear Arms, shall not be infringed.” Others in attendance included lawyers who have argued for and against the constitutionality of various American gun laws, British constitutional historians who have addressed the constitutional inheritance that informed American ideas concerning the right to bear arms, and scholars of American gun culture and violence. In addition, curators of a number of firearm museums attended, including the curators from the Autry Museum of the American West, the National Firearms Centre of the British Royal Armouries, and the Cody Firearms Museum at the Buffalo Bill Center of the West. The expertise of the participants was thus broad and deep, and, on paper, the symposium offered an excellent opportunity to move forward the debate over gun culture and gun rights. The historians, legal scholars, and curators, however, often expressed such radically different perceptions of American and British history that little consensus emerged about how to reframe the debate. Three of the papers that concerned laws regulating the carriage of guns demonstrated the challenge of finding common ground. Discussion ranged from the 1328 Statute of Northhampton to nineteenth-century concealed carriage laws, with presenters taking often diametrically different views about the extent to which authorities in England, colonial America, and the United States allowed subjects to carry arms in public. Participants marshalled local bylaws, court decisions, legislation, legislative debates, and the work of various legal treatise writers. The debate became fierce, with some participants alleging sloppy historical work by their opponents or even intentional misinterpretations of the facts. Some participants looked up and shared sources on smartphones in the middle of discussions to counter assertions made by others. Another ferocious debate occurred in a session entitled “Guns and Constitutional Rights.” Two leading protagonists in the fight over the meaning of Article VII of the English Bill of Rights of 1689, Lois Schwoerer and Joyce Lee Malcolm, challenged each other about what was meant by the provision’s language: “That the Subjects which are Protestants may have Armes for their Defence suitable to their Condition and as allowed by Law.” Malcolm and Schwoerer sparred about whether this provision secured to British subjects a right to firearms. Did the drafters of the English provision mean to design a constitutional protection for all Englishmen to possess firearms for self-defense, or was the provision more narrow, limited to Protestant men of a certain class (“suitable to their Condition”) and by the existing laws of England, such as the game acts (and thus “as allowed by Law”). As the only participant from a Canadian university at the symposium, I was both impressed and enthralled and perplexed and annoyed by the papers and discussions. The intelligence of the participants and their meticulous research and skilled marshalling of evidence was impressive and enthralling. What perplexed and annoyed me were the unstated agendas and ideological frameworks shaping the debate. A major factor in the discussion about the original meaning of Article VII of the English Bill of Rights, for example, is that this question impacts how American judges view the Second Amendment. Similarly, looming in the background of the discussion of carriage laws was the importance of this historical fight in the current political debates and legal issues raised by the passage of ‘open carry’ laws in some American states, which allow citizens to holster pistols or even carry semi-automatic assault-rifle-style firearms. Also looming in the background, though largely unquestioned in the historical to and fro, was the jurisprudential terrain on which these battles are fought. Recent Second Amendment cases have been decided by judges employing ‘originalist’ interpretations. This way of deciding constitutional issues is based on the premise that the American Constitution’s meaning was fixed at the time of enactment. In the context of Second Amendment legal scholarship and judicial decision making, this means that much energy is spent investigating whether the Framers of the American Bill of Rights saw the right to bear arms as an individual right or as a collective right connected to the militia. For most of the twentieth century, the collective right interpretation held sway. However, a majority of the United States Supreme Court in District of Columbia v. Heller (2008) decided that the Second Amendment protects an individual’s right to possess a firearm for traditionally lawful purposes, such as self-defense within the home. In a subsequent case, McDonald v. Chicago, the Supreme Court held that the Second Amendment extends beyond federal enclaves to the states. The majority opinion in Heller, written by Justice Antonin Scalia, reflected a faith in the originalist approach. The decision employed historical sources to support the view that the right to keep and bear arms belongs to individuals. The rules of the game employed in Heller and McDonald mean that history matters on the battlefield populated by the historians, legal scholars, and lawyers at the symposium. Each side disparaged the other. For example, one critic of Heller called the history written by scholars supporting an individual right interpretation of the Second Amendment ‘law office history’ — that is, historical analysis close to indistinguishable from the one-sided legal submissions lawyers submit to the courts. Unfortunately, there were few concrete suggestions for how to bridge the gap between the two sides or how to move the debate forward through new sources or new approaches. I found myself feeling comforted that in Canada history usually plays a more minor role in constitutional interpretation. Canadian constitutional thinking is dominated by the ‘living tree’ analogy made famous in the 1929 Edwards v. Attorney-General of Canada case (the ‘Persons case), in which Lord Sankey declared that Canada’s constitution was a “living tree capable of growth and expansion within its natural limits,” and that it was a document in “a continuous process of evolution.” In the 1980s, the Supreme Court of Canada cited Edwards to support the ‘purposive approach’ to interpreting the Charter. This requires that courts “go beyond literal meaning and to delve into the fundamental and underlying reason for the law or guarantee at issue.” One result of this understanding is that the ‘original intent’ of the drafters of Canadian constitutional documents is usually of modest importance. 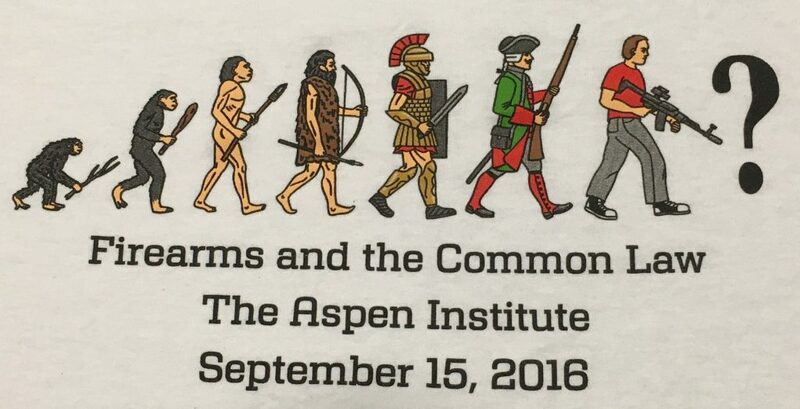 I left the Aspen Institute symposium with the hope that in the context of gun rights in America, some day, history won’t matter so much. Blake Brown is an Associate Professor of History and Atlantic Canada Studies at Saint Mary’s University and is the author of Arming and Disarming: A History of Gun Control of Canada (University of Toronto Press and the Osgoode Society, 2012). Joyce Lee Malcolm, To Keep and Bear Arms: The Origins of an Anglo-American Right (Cambridge, MA: Harvard University Press, 1994); Lois G. Schwoerer, Gun Culture in Early Modern England (Charlottesville, Virginia: University of Virginia Press, 2016). On ‘law office’ history see Martin S. Flaherty, “Can the Quill be Mightier than the Uzi? : History ‘Lite,’ ‘Law Office,’ and Worse meets the Second Amendment,” Cardozo Law Review, 37 (2015): 663-679. Edwards v. Attorney General of Canada,  A.C. 124. Robert J. Sharpe and Patricia I. McMahon, The Persons Case: The Origins and Legacy of the Fight for Legal Personhood (Toronto: University of Toronto Press and the Osgoode Society, 2007), 203. Excellent article. Extremely interesting. Thank you for sharing. Had my attention right to the end.